Yesterday, GURPS Ultra-Tech was sent off to the printer -- all two hundred forty pages of guns, gear, and gadgets from the future, illustrated in full color, with descriptions and rules by David Pulver, with Kenneth Peters. I'm looking over the files now, for our traditional preview pages. Let me tell you, it's harder than it looks; there are simply too many really, really cool bits in here to narrow it down. Regardless, I shall persevere, and the first sneaky peekies will show up this week. Now, the files fly through the ether, to the mysterious Place of Printing. In a couple months, beautiful hardcover books will float back to us. I can't wait. 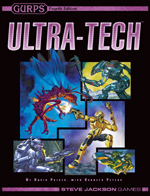 GURPS Ultra-Tech is scheduled for release in February 2007.